On behalf of the Camden County Board of Commissioners, thank you very much to all of the folks who attended the Federal Aviation Administration’s (FAA’s) public hearings on the draft Spaceport Camden Environmental Impact Statement (EIS) in Kingsland, Georgia on April 11 and 12, 2018. We encourage your involvement in the FAA’s environmental review process, and we appreciate the input you provided to the FAA and to the Spaceport Camden Team. During the FAA’s public hearings, several individuals expressed interest in learning more about the Spaceport Camden project, including where Camden County is in the FAA’s Launch Site Operator License application process. In an effort to improve transparency in the project development process, the Spaceport Camden Team is working to make that happen. Over the next several weeks, we will be stepping up our efforts to provide you with the information you are requesting. Please be sure to check www.spaceportcamden.us, our Facebook page, and local newspapers for project updates and additional information about topics of interest. Camden County intends to submit the Launch Site Operator License application in the near future. As noted during the FAA’s public hearings, Camden County must follow the process described in 14 Code of Federal Regulations (CFR) Part 420, License to Operate a Launch Site. Before making a license determination, the FAA will conduct environmental, policy, location, and safety reviews. The EIS process will fulfill the environmental reviewportion of the license application. No decision can be made or license issued until the NEPA process is complete. The policy review determines whether potential exists to affect U.S. national security, foreign policy interests, or international obligations. For the launch site location review, Spaceport Camden must demonstrate that at least one type of expendable or reusable launch vehicle can be safely flown. In the safety review, Spaceport Camden must demonstrate an understanding of the hazards and discuss how operations will be safely performed. The Board of County Commissioners has heard and understands your concerns about the safety of spaceflight operations from the proposed Spaceport Camden property and is working on a process to communicate additional information to you. Several components of the license application contain proprietary information, and certain information used in the analysis is subject to International Traffic in Arms Regulations (ITAR) restrictions. However, the Board of County Commissioners is diligently working to share allowable information so you are better informed during the license application process. Prior to release of this information, the County must seek approval from the appropriate authorities so that the County does not violate any federal laws or regulations.Stay tuned for additional information about submission of Camden County’s license application to the FAA. 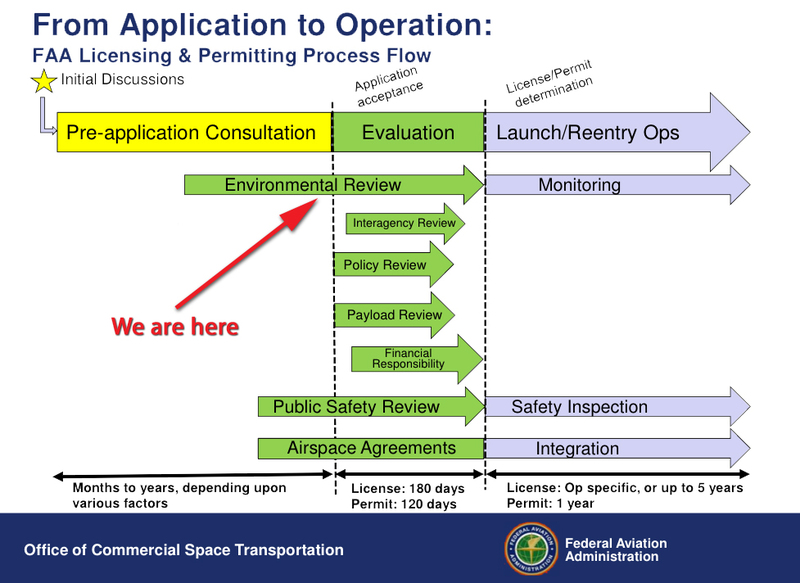 As noted above, the development of the EIS is one component of the FAA’s Launch Site Operator License application process. After the public comment period for the draft EIS is complete, the FAA will respond to the comments received on the draft EIS and publish the Final EIS. After the 30-day waiting period, the FAA will issue the Record of Decision (ROD). The ROD willexplain the FAA’s decision regarding the environmental review for the license application. While the ROD completes the environmental review process, it does not represent an FAA decision to issue a license for Spaceport Camden. The FAA is accepting comments on the draft EIS through June 14, 2018. Comments can be mailed to Ms. Stacey M. Zee, Environmental Specialist, Federal Aviation Administration, c/o Leidos, 2109 Air Park Road SE, Suite 200, Albuquerque, NM 87106. Comments can also be sent by email to FAACamdenSpaceportEIS@Leidos.com. The draft EIS and supporting materials are posted on the FAA’s project website. For more information about the Spaceport Camden project, visit www.spaceportcamden.us. If you have questions about the FAA’s environmental review process or if you would like to provide comments on the draft EIS, contact Stacey Zee, the FAA project lead. Previous Post What is the Spaceport Camden Draft EIS?